Happy February everyone. I wish you all a happy Valentine’s day and a wonderful Black History Month. In honor of African Americans, we will be putting up some information on some on some of the best and most influential African American musicians in the world. 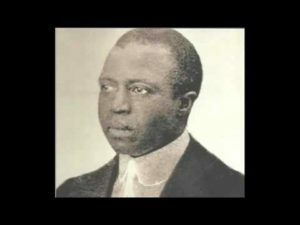 Today we’ll talk about a famous pianist and composer named Scott Joplin. Mr. Joplin gave his whole life to the music profession. He was born in Texas in the 1860s to a family of railroad workers. He gave up life as a railroad worker to follow a career as a traveling musician. Even though it was hard he kept at it. He never gave up playing and writing music even when no one saw how good he was.